Update your classics. 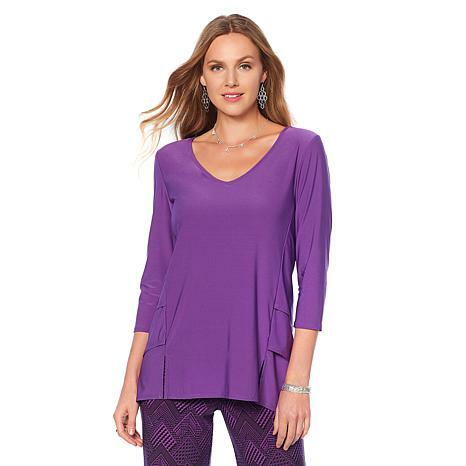 An essential wardrobe enhancer, this jersey knit top with tiered insets adds everyday elegance to your favorite bottoms. Skirts, pull-on pants and jeans are all a match made in heaven when you add this super-comfy, super-versatile top. This top is perfect, lays well, not clingy. I will be ordering in other colors. We need spring colors. Like this top better than I even expected to. The V neck, 3/4 sleeves combine with the insets to make me look like I have a waist and shape that I don't have. Can't ask for more than that. Thanks much, Anthony, for making me look thinner and better.Oh, and runs true to size. Liked this top so much went back for other colors. The top is slightly boxy, which hides a multitude of sins. I ordered my normal size and the top fits loosely. . I think that the pleats on the sides add to the the tops interest. The v neck on me is not revealing, but deep enough to wear a necklace. It can be dressy or casual. ...with this top! Its a very slenderizing style. Sizing was accurate.